This no longer seems like a good idea for a simple reason: no time. And yet, here I am with an intention to show up and respond to your question. I have grabbed a few journals out of the bookcase where I stash them — below is what was left behind. I know, right? You might think, “well, Elizabeth . . . you are old — maybe this is just a lifetime of scribbling each morning” . . um, sad truth alert? This particular bunch of journals only marks the journey since about 2006 ish . . . so, seven years? Yeah sure– I have a thousand answers to those questions and in a perfect world I would have a solid eleven months to expound upon all the dimensions wrapped up within those questions about one of the central activities of my life. However, as mentioned above, I got no time, baby! In this moment, it is 7:30 am — I have to feed Daisy, get her out for a good walk, get dressed (possibly wash my face, but that is often optional), feed me, answer personal emails, BLOG<–!! since I set myself to do that every day this month of November, eep — get my apartment cleaned up for weekend guests arriving this afternoon (hi Bella and Angie!) and be at the office asap as I have bucket loads of Squam work that is calling to me (which means, in reality, that I will be at the office for most of Sunday). Nothing huge, nothing unlike any other human being getting the day underway when life is rolling out the door . . . and yet, in order to have MY morning, I got up at 6 am — lit candles, burned some sage, settled into my white chair and journaled a bit with some music going– thrilling, I know. The point is: there is never “enough” time. Not ever. Whether it is journaling you make a priority in your life, or the gym, or yoga or reading or painting — whatever it is — you gotta simply show up and use whatever you have. For you and me this morning, my dear Scottish lass, we now have about nine minutes remaining before I must shut this laptop and go. So answer # 1: HOW? Show up. Pen to paper– brain dump — nothing fancy, nothing shaped, simply write whatever is running across your brain with no judgement, no analysis. NOTE: choose your best time of day. Obvs, I am a morning person — I could never keep a journaling practice at night. But maybe lunchtime is your best time of day? or evening snuggled into your bed with a cup of tea? You have to align with YOUR best energies, for sure. What do you journal about? My life. Now, this will differ for each of us. Me? I am all about the soul growth. I want to do better, be better, experience the joy of life more deeply, more consistently and understand the pain of life so as to be a compassionate witness to myself and others. 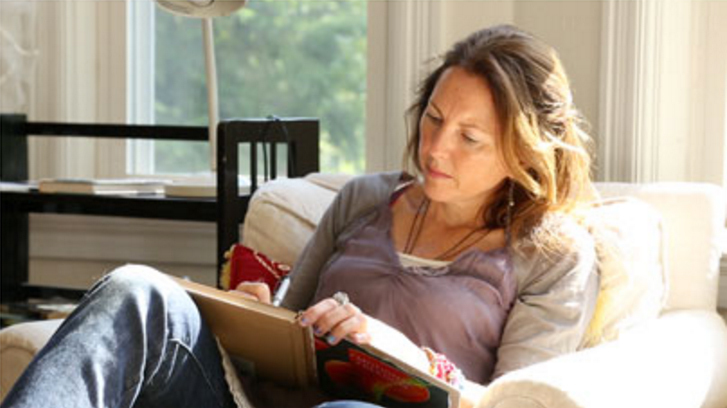 But that’s why I journal — to try and make sense of what happens in my life, and be honest. I also read widely and tend to capture quotes, passages from what I am reading into the journal with notes and prompts to myself — so it is also a place of reflection. I just grabbed one of the old journals here next to me that I pulled out for your photographs above. I thought I would simply type out a passage– but it’s too much for this format. I dive deep and don’t edit myself in any way — and, if you think I am Pollyanna in the real world– oh dear lord, my scribblings here would have you running for a stand-up comedy bar in the bowels of an urban setting where some acerbic sarcasm would provide a strong tonic to the vibration of my focus on the light. Bottom line? I write for me. This isn’t for public consumption at all. It’s a personal exercise in spiritual and creative growth. Although, one thing I have learned since starting Squam — the creative journey IS the spiritual journey. 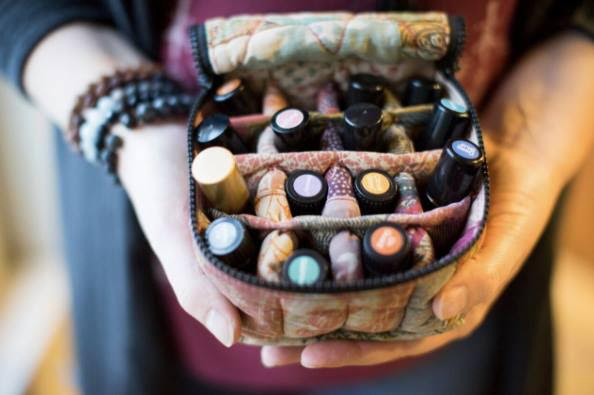 If you really invest and commit to expressing yourself through some creative means — doesn’t matter what: writing, painting, drawing, gardening, weaving, knitting, sewing, cooking, photography — it. doesn’t. matter. — if you pour your HEART into it and want to improve from a place of joy, you will grow your spirit. It is just what happens. So that bring me to your last question: WHY? Because I was so unhappy in this world for so long. I didn’t understand what the point was and was pretty keen on checking out. I now no longer feel that way at all. (of course, let the record show, I am always ready to go– anytime — so if I get hit by a bus tomorrow, just know I love you and it’s all good). A HUGE change for me was not worrying about someone I love in pain. Not my job. I honor any and all choices they make. They wanna be a heroin addict? They wanna know what that life experience is all about? I will honor their choice. It’s not how I want to live– but I honor their choice since I know nothing about their karma or how they are seeking to grow their soul in this lifetime. So, someone I love is taking a hard road? committed to depression, committed to anger, committed to physical illness, you name it– I will honor their path and not process their life choices as my pain. So, challenges show up for me every day. Of course they do. That’s life. How I respond to these challenges has totally changed. I now see the EXPERIENCE of life as a wild romp through a very challenging physical terrain. Big hills! Wild, untamed river that must be crossed! Endless desert that has me spiraling in circles! I still know pain. I still know sorrow. I still know grief. The difference is that I experience ALL of that through the lens of joy, light and love. Journaling has given me that. And so? I keep showing up. 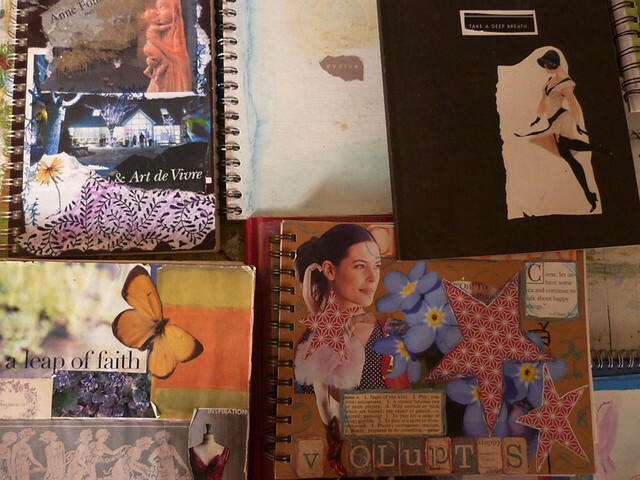 I kept a journal for a year or so in high school–but they were discovered and I could never do it again after that. I think that's why every time I've attempted to blog, I've always done so mostly anonymously. Still have that shaking feeling of violation, I suppose. Even though I know that even if I don't tell people in my daily life, 'hey, I scribble online over here: X', it's still out there. But, somehow it feels safer. (But, I have no idea how manage to be so prolific across two websites and your journals! You, my dear, have a lot to say. And I, selfishly, am glad you share some of that with us 🙂 ). oh wow– I definitely am going to need a follow-up post about the violation of having my journals be read– that happened to me and I BURNED every single volume I had kept from 8 years old to 22 years old. . . yes, I did. Oh my, I need to hear that story! I bagged all my HS year journals, drove them with me to college, and then proceeded to drive around to various dumpsters and throw them away, one by one. Such a shame that we lost those pieces of our lives—you more so, as 8 years old to 22 years old, wow, what a timeline! I receive this post as a gift, thank you. I've recently wandered away from my journaling and, I believe as a result, have felt a bit adrift lately. Thank you for expressing, so honestly, why you journal and reminding me why I do as well. Elizabeth- this spoke to me so loudly today! I SO need to stop trying to fix other people's “problems”! I also really love Byron Katie, and am still working on this one big time. 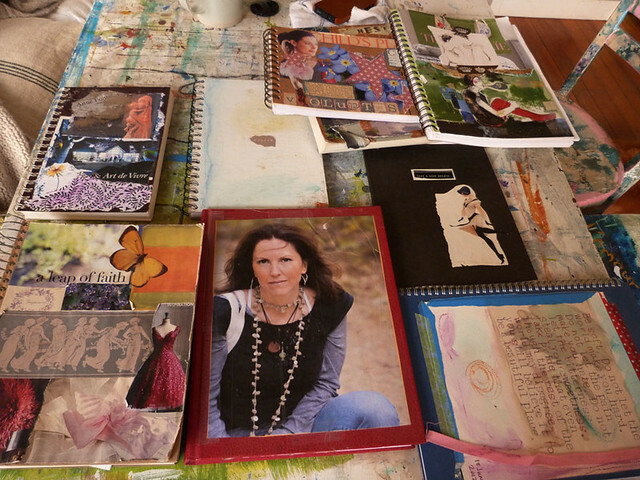 As for journaling- I've thrown away or burned every journal I've ever filled for fear that it will be read and misunderstood. It also feels liberating to me-like I'm letting go of the past and have made room for growth. I don't blog for the same reasons, but lately I've been wanting to just for the sake of feeling like an active participant in the community of women who's blogs I read, instead of a silent observer. Reading your words and seeing your pics remind me that there are people in the world that I can relate to, when sometimes I feel like I'm in a world of people who have prioritites that just don't make sense to me. 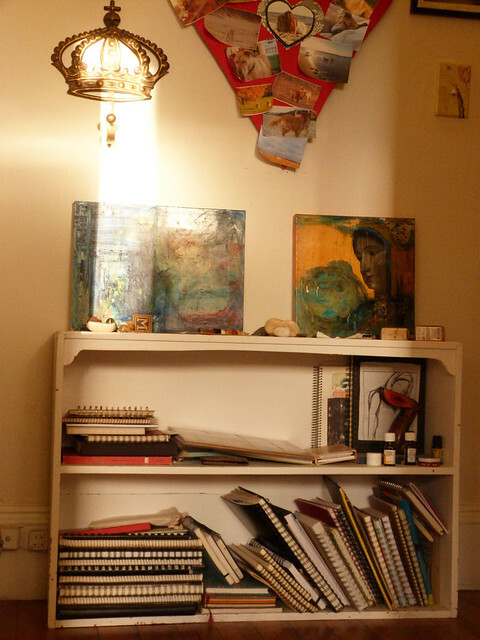 I too have stacks and stacks of filled spiral bound journals, notebooks, in baskets, on shelves in the attic…I think we could be minor honorary stockholders in the company, if there is such a thing, couldn't we? 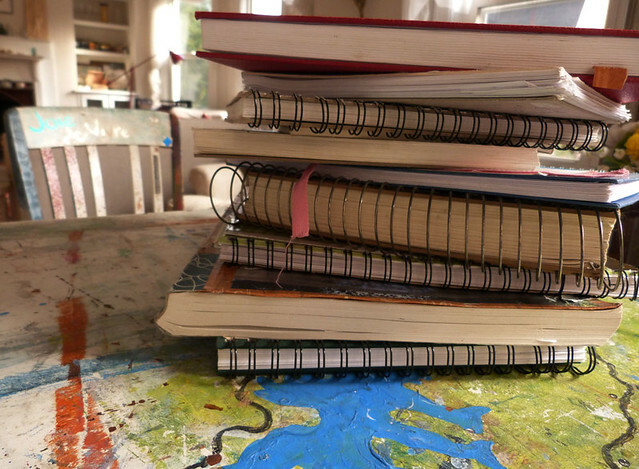 Those journals are my favorites because I can just dump in them, doesn't hafta be pretty. BUT, people over the years have given me all these PRITTEE journals that I hesitate to write in because they are TOO PRETTY. However, I am finally using them up because they have just sat blank or partially filled (with pretty notes) on my shelves for years and I cannot abide those pretty blank pages anymore. So I am finally messing them up. But only because I have not allowed myself to buy any more of my beloved spiral journals (I used to stockpile them) until these pretty ones are full. Of my good, my bad and my ugly. >sigh< I can't wait to buy my next spiral bound. XO P.S. All That Matters, Metta Living, Expressive Arts Institute at Salve and Katharine Rossi from Sacred Stream — other great Rhody gigs (and the Red Tent RI event in Cranston during Women's History month in March). Yep, good stuff in your wee state. it had to happen — I can tell you the deets .. . but I am kinda sad I couldnt' have just buried them somewhere, you know? . . . oh well. well, i have to say. when your commentor asked you to write about this, i was hoping you would. and i'm glad you did. i'm going to say, “i admire you”. can't help it. Yes! Yes! Yes! my dear this post touched me deeply. reminded me of why I show up on the page…to dig deep…to explore thoughts, feelings, ideas, and to let it all loose. It is a purely safe space where there is enver any judgment….just me, showing up. What a gift! Had to laugh at your “obvs I am a morning person” … I'm a real nightowl so we'd probably coincide online nicely given the time difference between Scotland and the US! Thank you so, so much for taking the time, effort and care to write this post. You are marvellous! Did I ever tell you? I'm sure I did! Oh, and Byron Katie … Her book helped me rid myself of a longstanding demon. Remarkable stuff.